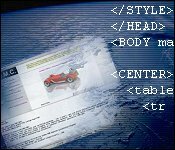 We have developed a number of websites over the past few years - a combination of static HTML pages and more than enough CGI / PERL, ASP and ISAPI "live" websites. Each and every one was wrote by hand in Notepad, something which surprised even ourselves - but no claimed "alternative" products was as pure or effective as the old trusty Microsoft freebie - and we long abandoned WYSIWYG editors due to clunkyness and not being immediate. The downside of course, was that Notepad is non visual - after editing the HTML source, we save then open in our browser. The whole process wasn't quite quick enough - and often there would be mistakes which were difficult to spot in something like a complex table. ...but the killer feature is that a separate pane holds an IE Window that is updated live as you type - offering all the benefits that a visual WYSIWYG editor offers, with the unrestricted and immediate power of raw code editing. It's perfect for both pro's and newbies alike too - we've been told it's a great learning aid for those starting out with HTML! Aside from the obvious removal of the edit-save-open-view cycle, one bonus side effect that we did not envisage was the way we can now navigate multi-page websites easily. Simply by clicking on a link in the preview pane - we can automatically switch from one document to the other as the correct source HTML is loaded into the edit pane. We hardly ever need to use the File / Open menu anymore, and having a separate instance of Notepad open for each document is a thing of the past! Navigate large sites the way the user does - click a link in the preview pane, and the source is automatically loaded in the edit window! Need to add a new menu link to every page of the site? A single insertions button does it all!